The Geomatic Attic tested out the Sterndale Bennett Theatre as a new venue and packed approximately 160 people into the room, Sunday, March 24 for a captivating show with Sarnia, Ontario and newly minted Juno Award winner Donovan Woods and the opposition, his backing band including lead guitarist Dean Drouillard, who has played with Buffy St. Marie, Deep Dark Woods drummer Joshua Van Tassel, bassist John Dinsmore and keyboardist Robbie Grunwald. 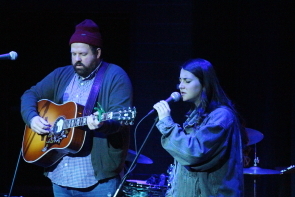 Woods had a mellow, whispery contemporary folk pop sound along the lines of Michael Bernard Fitzgerald and Dan Mangan with a touch of Paul Simon. He switched guitars and patch chords pretty much every song, telling stories all the while.